WEST LAFAYETTE, Ind. 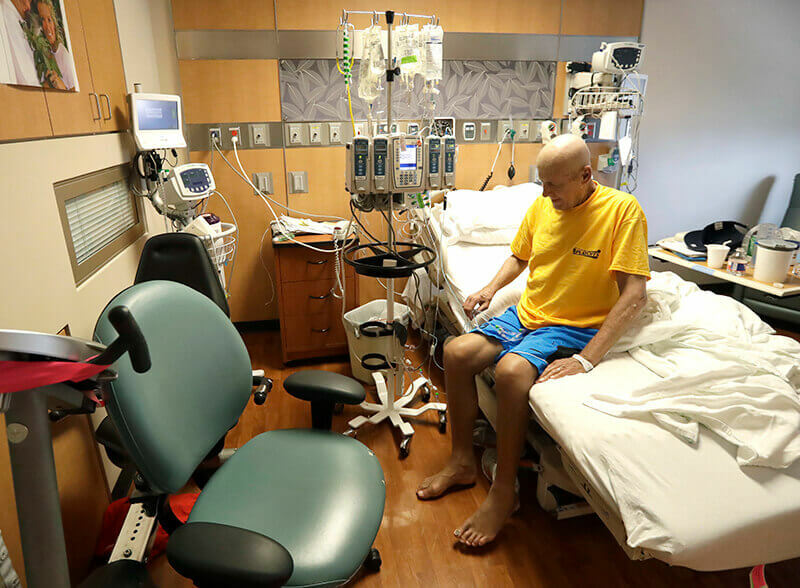 – Researchers have been struggling for years to find a treatment for patients who have a recurrence of acute myeloid leukemia (AML), an aggressive blood cancer that is one of the most lethal cancers. About 19,520 news cases are diagnosed a year, and about 10,670 people a year die from it, according to the American Cancer Society. Purdue University researchers are developing a series of drug compounds that have shown promise in treating such cases. About 30 percent of AML patients have a mutation caused by a kinase called FLT3, which makes the leukemia more aggressive. Inhibitors of FLT3, such as Radapt, approved last year by the U.S. Food and Drug Administration, have shown good initial response to treating leukemia. Gilteritinib, another FLT3 inhibitor, was recently approved toward the end of 2018. But AML patients on FLT3 inhibitor therapy often relapse because of secondary mutations in the FLT3 and existing treatments have not been fully successful in treating those cases. 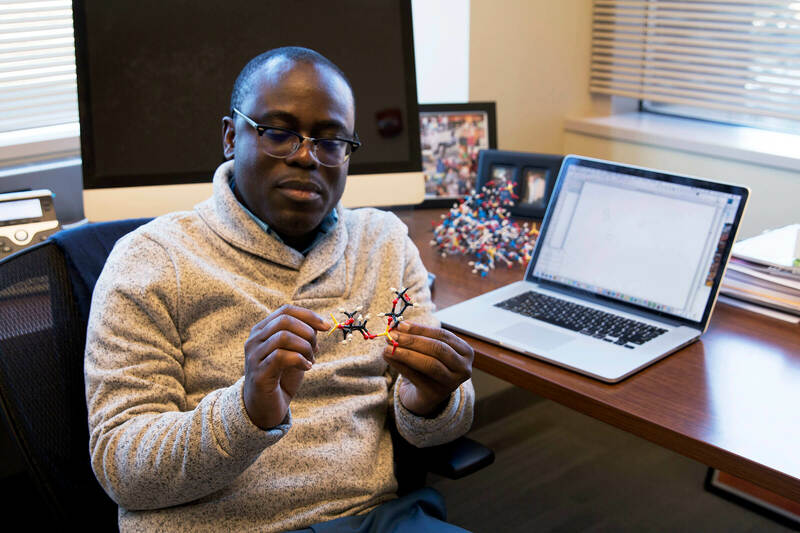 Researchers on a team led by Herman O. Sintim, the Drug Discovery Professor of Chemistry in Purdue’s Department of Chemistry, say they have developed a series of compounds that work not only on AML with common FLT3 mutation, but also drug-resistant AML harboring problematic mutations, such as the gatekeeper F691L mutation, which some leukemia patients who relapse harbor. “These compounds have a great potential to be the next-generation AML therapeutics for relapsed patients who no longer respond to first- or second-generation FLT3 inhibitors,” Sintim said. The results of the study were published Friday here in the journal EBioMedicine. 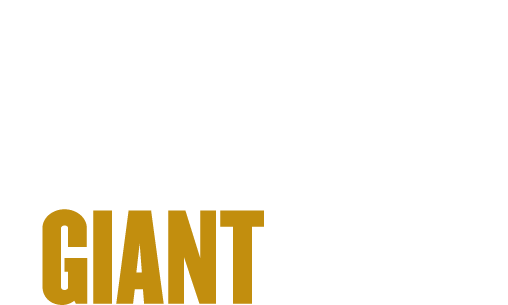 The research aligns with Purdue's Giant Leaps celebration, recognizing the university’s global advancements made in health, longevity and quality of life as part of Purdue’s 150th anniversary. This is one of the four themes of the yearlong celebration’s Ideas Festival, designed to showcase Purdue as an intellectual center solving real-world issues. Results of the study are encouraging because, while advancements have been made in many other forms of cancer over the past three decades, advancement for AML has been slow. AML, which accounts for only about 1 percent of all cancers, occurs when blood cells fail to mature or differentiate and multiply unchecked, causing a lack of adequate oxygen-carrying red blood cells. AML is uncommon before the age of 45, but it does occur in children. The five-year survival rate is about 30 percent, and for patients over the age of 65, the five-year survival rate is less than 10 percent. The compounds the Purdue researchers are studying, alkynyl aminoisoquinoline and alkynyl napthyridine, have been successful in preclinical studies, Sintim said. “In mouse studies, almost no leukemia burden was visible after compound treatment for only a few weeks. Crucially this new class of FLT3 inhibitor also works against drug-resistant secondary mutations, such as the problematic F691L mutatio,” Sintim said. In the clinic, the goal is to reduce leukemia levels enough so that a patient can undergo a bone marrow transplant. Most often if the leukemia burden is not drastically reduced before bone marrow transplant, there is a high likelihood that the AML will return. Sintim said the compounds the researchers are developing have shown no signs of toxicity. Observations in clinical testing show that high doses of the compounds result in no weight loss, irritability or essential organs dysfunction. Another advantage of the compounds the Purdue researchers are developing is they can be taken orally, which makes it easier for patients to take at home compared with an injection. Sintim said there’s much still to be learned about AML. Sintim also is a co-founder of a biotech startup called KinaRx LLC, which has licensed the compounds the researchers are working on through Purdue’s Office of Technology Commercialization. Both Sintim’s lab and KinaRx LLC are looking for development partners. Amino alkynylisoquinoline and alkynylnaphthyridine compounds potently inhibit acute myeloid leukemia proliferation in mice. Background: Acute myeloid leukemia (AML) remains one of the most lethal, rarely cured cancers, despite decades of active development of AML therapeutics. Currently, the 5-year survival of AML patients is about 30% and for elderly patients, the rate drops to less than 10%. About thirty percent of AML patients harbor an activating mutation in the tyrosine kinase domain (TKD) of Fms-Like Tyrosine kinase 3 (FLT3) or a FLT3 internal tandem duplication (FLT3-ITD). Inhibitors of FLT3, such as Rydapt that was recently approved by the FDA, have shown good initial response but patients often relapse due to secondary mutations in the FLT3 TKD, like D835Y and F691L mutations. Methods: Alkynyl aminoisoquinoline and naphthyridine compounds were synthesized via Sonogashira coupling. The compounds were evaluated for their in vitro and in vivo effects on leukemia growth. Findings: The compounds inhibited FLT3 kinase activity at low nanomolar concentrations. The lead compound, HSN431, also inhibited Src kinase activity. The compounds potently inhibited the viability of MV4-11 and MOLM14 AML cells with IC50 values less than 1 nM. Furthermore, the viability of drug-resistant AML cells harboring the D835Y and F691L mutations were potently inhibited. In vivo efficacy studies in mice demonstrated that the compounds could drastically reduce AML proliferation in mice. Interpretation: Compounds that inhibit FLT3 and downstream targets like Src (for example HSN431) are good leads for development as anti-AML agents. Funding: Purdue University, Purdue Institute for Drug Discovery (PIDD), Purdue University Center for Cancer Research, Elks Foundation and NIH P30 CA023168.